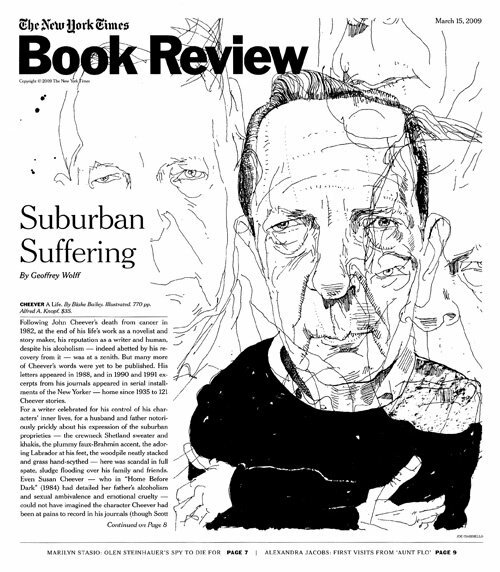 This was an "unconscious" drawing done as an attempt to free myself up for a cover portrait of John Cheever for the NYT Book Review. After being intimidated by a blank sheet of paper and the prospect of having to produce a drawing worthy of a cover... I resort to just "playing" around on any scrap paper regardless of whether I've already drawn on it. It's a game I need to play with my head to avoid being too uptight. In this case, I liked what was happening. 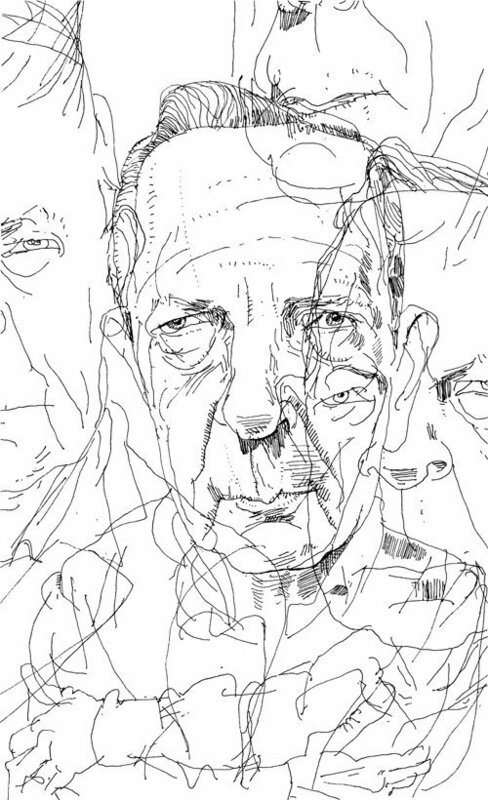 The overlapping/muliple heads seemed to work with the fact that Cheever was a very complicated and tortured soul. Fortunately (to my surprise) the AD, Nicholas Blechman and the editors agreed. After some tweaking of the image to make it work better for a cover... it ran. Joe, I was just about to email you to tell you how much I love this. It's on my kitchen table where I usually doodle. It's humbling to see this up against my drawings. That's the magic. I love it. Nice Cover Joe, I do like the black that you added for the cover adjustment. 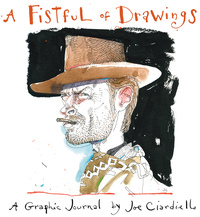 What admire about your drawings is that you do them in pen and ink, a medium that terrifies me. Eraser = security blanket = me. This is ultimate virtuosity, and moves right through you like a spirit. This is magic. Freeing yourself from the pressure of what a cover for the Times brings and giving it all to the story and the interpretation can be only achieve with talent and experience. You're a pro and and a constant point of reference, Joe. Great cover, Joe. Very striking and unique; really grabs the viewer's attention. A perfect meeting of technique and concept, Joe, and fun to hear how your intuition still inspires. Great one, Joe. Very Ciardiellic. It a good thing they went with this Joe. It's what you do best AND It really works well with the biography. Bravissimo. Wow Joe, this is a knockout!! Polyrhythmic. Just when I thought you couldn't possibly get any better...! Really stunning, Joe. Joe, your drawing got to me to read the review and the review got me to re-read some John Cheever stories last night. Great stuff as always. I'm on board with this. Nice. Thanks for the comments everyone, greatly appreciated. It was a bit of a stretch for me, so it's nice to know you all liked it. Unwittingly, the perfect solution! And I look forward to reading the bio. Bailey did a fantastic job with Richard Yates. You got his lip DOWN, Joe. Great free-form style in this. This is a regular Soul Stew of an illustration. 2 cups of Joe, 1 tablespoon of playfulness and 1 teaspoon of excellent art direction. This illo cooks. S w e e t . . . . This one stopped my morning sorting of the paper for a few minutes just to admire it. No one's better at this thoughtful line work than you. Joe, I keep coming back to your post. I really love the abstract quality of the initial drawing, with the multiple eyes, the overlapping, and the nervous, self-hugging arms. I don't know if there is a way of running something like this as is, because it might not have the visual impact required for a cover. Your black contrasts add the punch, and the results always look so great on the page. Thanks Cathleen. I agree about the original drawing, but I also understand that they needed something stronger to make it work for a cover. Conscious or unconscious, it's pretty damn beautiful. The joy of happy accidents. It's reassuring to know that even greats get intimidated by the page from time to time.